- it is mechanically strong, possessing biological inertness, corrosion resistance and durability, material. Such a capillary tube is characterized by high chemical resistance, it is suitable for use in aggressive environments. Complex multicomponent alloys with a high percentage of copper, silicon, nickel, molybdenum, etc. have the highest resistance. Depending on the environment of use, one or another brand is selected with a specific set of components in the alloy. The company Staines Steel Ukraine offers to buy a stainless steel capillary pipe with an outer diameter of 6 mm and a wall thickness of 1.0 mm, AISI 304 brand from a warehouse in Kiev and with delivery in Ukraine. The surface of the stainless pipe - polished (mirror). 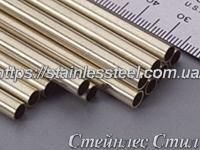 Stainless capillary tube is indispensable in the food, medical and chemical industries. It is used in electronics and medicine, in aircraft manufacturing for the transit of gases and liquids, as well as in instrument engineering and for special-purpose parts.